Among the rare Canadian stamps in circulation are the airmail issue varieties. These first emerged in 1928, and were in use up until the 1940’s. These include four different Air Mail Special Delivery Stamps which were also in use. While there are a number of regular airmail issues, many unofficial ones also exist, which were used for particular flights and events. 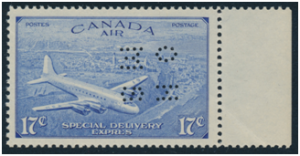 This type of Canadian postage stamp was created to cover the premium charged for airmail service, which came at a higher rate than other delivery services. It should be noted that the Canadian government was not the first entity to handle airmail flights. Instead, private companies and carriers were enabled to carry airmail from larger cities into encampments and remote towns that dotted the developing wilderness territories. These carriers could issue stamps on their own to cover the postage involved. In addition, local aero clubs issued their own stamps, which were used on mail that was carried during special flights, or the inaugural flights of certain planes. One example is a $1 stamp of a red and blue biplane, commemorating a flight that went from Toronto to New York, which occurred on August 25th, 1919. If you are interested in learning more about these rare Canadian stamps, you should note that there is more information listed in the Unitrade Catalog. You can also contact Treasure Coast Stamps; we can help you discover more about your favorite Canadian stamps.